Italian cypress trees are evergreen trees with an upright, vertical columnar shape. Tolerant of wide range of soil types, Italian cypress trees require full sun and well-drained soil to thrive. As an evergreen, the Italian cypress keeps its leaves and color all year long. Alternatives for Italian cypress include evergreen shrubs and trees with a similar upright, columnar shape and a smaller width than height. Cedar and junipers, as well as other cypress varieties, are ideal alternatives. 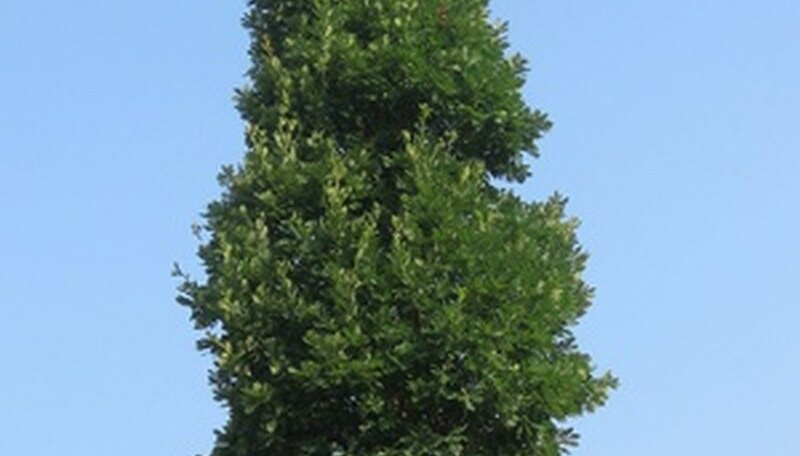 Similar to the Italian cypress, the rubicon white cedar is also an evergreen shrub with a dense, compact columnar form. Rubicon white cedars grow 15 to 25 feet tall and have short needle-like leaves that are blue-green in summer. Like the Italian cypress, the rubicon white cedar retains its leaves all year long. In fall, the needles turn plum for a rich look to the landscape. Rubicon white cedars have a moderate growth rate and require full sun to thrive. Planted in a wide range of soil types, including dry and moist soil, rubicon cedars make for an adaptable shrub. Rubicon cedars are ideal planted side-by-side as a privacy hedge along a backyard patio. The USDA hardiness zone for planting is 4 to 8. Similar to the Italian cypress tree, Lawson false cypress is also an evergreen tree with a dense, conical form. The erect branches are slow to grow and have a blue to gray color. Highly adaptable, the Lawson false cypress is ideal nestled along a front bed for a focal point to the yard. Lawson false cypress remains with color all year long and grows 6 to 10 feet tall. They require full sun to part shade and a medium to wet moisture content. They thrive in well-drained soil that’s neutral to acidic, similar to the Italian cypress tree. The USDA hardiness zone for planting is 5 to 9. Rocky Mountain juniper is an evergreen tree with dark green to blue foliage that grows vertically and holds its color all year long. The upright habit, similar to the Italian cypress has a narrow pyramidal shape. Rocky Mountain juniper has a slow growth rate and grows 30 to 40 feet high and 3 to 15 feet wide. Rocky Mountain juniper trees are tolerant of a wide range of soil types, except overly wet conditions. They thrive in full sun and are tolerant of high humidity, making the rocky mountain juniper ideal in arid, warm climates. Easily transplanted, Rocky Mountain juniper is ideal along the home as a makeshift screen or used in large containers flanking a front yard walkway. The USDA hardiness zone for planting is 3 to 7.